Deciding where to go and creating your itinerary for your honeymoon is an exciting thing – the world is your oyster and you can virtually go anywhere you want to go, provided you have the right budget. Asia’s one stop tourist destination, Singapore can be the best honeymoon destination for those who want to enjoy intimate moments with their new husband or wife, together with the most modern facilities and luxurious amenities. Singapore is one of the top destinations in Asia, where you will have no problem looking for a 5-star hotel to spend days and nights with the person you love. Attractions, places to see and things to do are endless in Singapore, giving you endless possibilities. Yes, it may be a cliche, as the Singapore Flyer is a mainstream attraction. Yet it hasn’t lost its charm as a romantic thing to do in the hustle and bustle of Singapore. The world’s tallest ferris wheel, nothing is more romantic then planting a kiss on your loved one as you reach the top of this 540 feet wonder. Gaze at the panoramic views of Singapore’s skyline and the glistening waters of the harbour, as you experience a truly remarkable experience that only Singapore can offer. 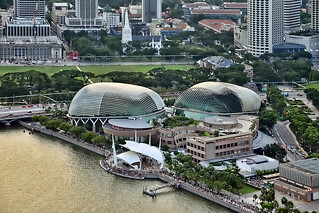 If you fancy culture and the arts, there’s no better place in Singapore than the Esplanade – Theatre on the Bay. This waterside building consisting of a Concert Hall, Theatre, Studio, Gallery, and Mall offers world-class performances by both local and international talents. Don your best dress and suit and spend a night of theatre at the Concert Hall. During intermission, head up to the 2nd floor and get to see exhibits of local and international artists. One of the oldest hilltop parks in Singapore, Mt. Faber Park offers the popular Singapore Cable Cars that offer 360 degree views of Singapore’s skyline, the Harbour, and Sentosa. Arrange the Sky Dining experience where you get to enjoy an exclusive and private Cable Car on your own, complete with delectable food choices. With the stars above you and water glistening below, it will be as if you’re both on cloud 9. 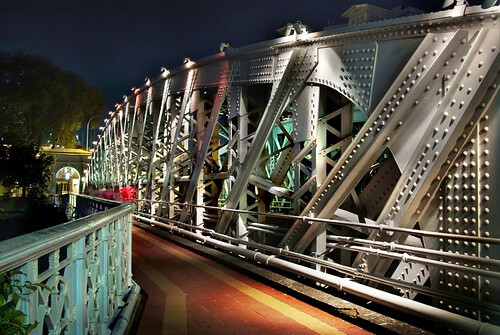 Once you’ve spent time in luxurious and extravagant places to go and things to do, spare an hour of your time and have a moonlit stroll on the Anderson Bridge. A popular romantic spot for both locals and tourists, this century-old bridge brings a simple and romantic charm to end your day. Buy some food from a vendor and sit on the benches for an intimate time. Buy a few red flowers and toss the petals in the waters, as legend has it that whoever this will be gives eternal love. On your last night in Singapore, there’s nothing more special and romantic than having a customized private dinner on a balcony in the middle of the Botanic Garden. Nestled inside this popular tourist attraction is Au Jardin Les Amis – a delicately restored colonial home that is now one of Singapore’s top restaurants. Choose from its wide selection of French cuisine, arrange a private dinner on the balcony overlooking the Garden, and enjoy a night of culinary extravagance and an intimate setting. As you go to these destinations, eliminate the worries of getting from one place to another by getting the services of a car rental. Hire an exclusive limo for your night at the Esplanade, and make it a truly luxurious event. Guest Author: Johnny Lai is the owner of Exclusive Limo and Car Rental, Singapore’s premiere car rental services, with the best quality cars and top notch quality service.